Caiman free games: Factory Pinball by Jere Sanisalo. 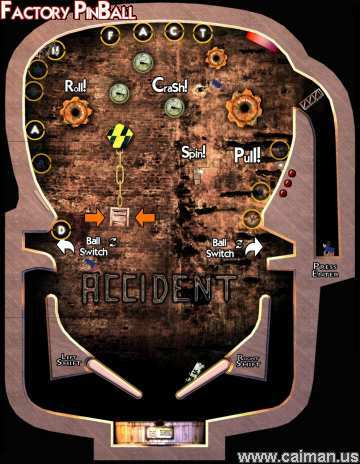 Factory pinball is a nice pinball game that will give players a new perspective on the game of pinball. The game engine is based on the Dismount engine so players of the Dismount series will know what to expect. Ball physics are great with combinations to aquire for point`s while creating the most amount of damage possible to the rag doll ball and there are even a couple of animal`s as balls. The table is not huge but has some nice things to bounce and spin off, graphics are good with pleasant in game music and some nice pinball game sound`s, with scrolling screen and is a must download for the pinball fan`s. The game supports user made levels and functionality.